Digimon Xros Wars (pronounced "Cross Wars") is the sixth anime series in the Digimon franchise, coming three years after the end of Digimon Savers. In many respects, it seems to be throwing back to its predecessors - the animation is reminiscent of the Digimon Adventure style, Chika Sakamoto returns to voice lead partner Shoutmon, a Greymon plays a significant role again, and the goggles are back - and yet in so many ways the series is significantly set apart from earlier Digimon iterations in concept. Xros Wars is the story of child prodigy and good Samaritan Taiki Kudo, who one day follows the dying voice of Shoutmon. His X Loader Digivice appears and, along with childhood friend Akari Hinomoto and "eternal rival" Zenjiro Tsurugi, they are sucked into the Digital World. The world-conquering Bagra Empire's army attacks the trio and the healed up Shoutmon joins in the fight. Together with his partners, the silent and loyal Ballistamon and the naive and star-dazzled Starmon and Pickmons, they defeat the army. However, the commander of the army MadLeomon absorbs the data of his subordinates and endangers Shoutmon and Ballistamon. When Taiki comes to the rescue him, Shoutmon and Ballistamon DigiXros together and put down MadLeomon, whose superior forces him and his remaining troops to retreat. With the lone wolf Dorulumon and his young charge Cutemon later joining them, "Xros Heart" is set for victory. Also opposing them as they fight the Bagra Empire is team "Blue Flare," consisting of the calculating Kiriha Aonuma and his partners Greymon and MailBirdramon. Filling the motivationally ambiguous slot is team "Twilight," consisting of the mysterious Nene Amano and her allies Monitamon, Sparrowmon, and DarkKnightmon. Xros Heart proved its worth and was successful in its quest, collecting all the Code Crowns and causing the Zones to reunite. However, Bagramon intervened and cast Taiki, Akari, Zenjiro and Shoutmon back to the real world, conquering the Digital World while they were gone and transforming it into a twisted empire of his designs. When Taiki and Shoutmon returned to the Digital World at the beginning of the second half of the series (Digimon Xros Wars the Evil Death Generals And The Seven Kingdoms), they found themselves tasked with taking on this rearranged digital empire and defeating the Seven Death Generals, its brutal governors. Kiriha and Nene allied with Taiki in his campaign, and their combined strength, tactical prowess and bonds of friendship proved to be more than a match for Bagramon's forces. Despite the show not being a success in its airing in Japan , it had good toy sales so the series was green lighted for a third arc  which is called Digimon Xros Wars the Young Hunters Leaping Through Time. Making this season the longest anime installment of the Digimon franchise. At this time there is no official word on whether a dubbed version is forthcoming, but Toei Animation has filed a trademark for "Digimon Fusion Battles" with the US Patent and Trademark Office, and there are reports that demographic tests of the show have been conducted, so it's possible. Crunchy Roll however has started hosting this series, starting with five episodes with three episodes added each week. You can watch them here. See also: the Digimon Xros Wars manga, an ongoing adaptation of the anime with a few significant differences and deviations. 108: The number of zones, and by extension, Code Crowns. A Death in the Limelight: Baalmon/Beelzebumon (twice) and Deckerdramon. Apollomon and Olegmon in episode 51 as well. Added Alliterative Appeal: D5 stands for Dimmension Delete and Deadly Destruction Day. All There in the Manual: The Digimon Dictionary refers to Xros forms as composites. In math, composites are made by using the value of one function for a variable in another, and this could explain the difference between Xros and the previous series's jogress evolution. All Your Powers Combined: Shoutmon X7 Superior Mode, in the most literal sense possible - he seems to be the merger of quite literally every Digimon alive save DarknessBagramon. Art Evolution: A lot of work has been put into the shading of the characters - far more than in previous series, making the characters look flat in comparison. In fact, though the characters have been drawn a lot like Adventure and Frontier characters, the animation style, colouring and shading looks more like The Melancholy of Haruhi Suzumiya with bits of Tengen Toppa Gurren Lagann thrown in - just look at the Evolution, Double Xros and Great Xros sequences. Heck, any of the digimon in the Generals' armies display this perfectly. Art Shift: Happens a lot with episodes involving Nene. Sometimes, she's the only one who's been drawn differently. Asteroids Monster: The yellow Pickmons. An Axe to Grind: The yellow Pickmons can DigiXros with Starmon to form an axe. Anyone Can Die: The Death Generals arc is made of this. If you are a Digimon and not one of the central partner Digimon, your chances of living through the whole show are rather slim. Audible Gleam: Makes use of this especially when Shoutmon X7 appears. Autobots Rock Out: the "We Are Xros Heart ver.X7" during the Final Xros and Final Battle with DarknessBugramon. Back From the Dead: MadLeomon who returned as a regular Leomon, Neptunemon, and AncientVolcanomon came back from the dead when the last Code Crown was found in episode 29. Almost literally everyone got revived in the final episode, notably Shoutmon, Damemon, Beelzebumon, Deckerdramon, Apollomon and Olegmon. Badass Abnormal: Zenjiro is pretty tough when wielding the Rare Star Sword. He's so tough that he was able to hold on against Musyamon. And Shoutmon. This very line pretty much cemented him in badassery. Lucemon: Now all of you should be turned to ash! Lucemon fires Dead or Alive at Taiki, but then Shoutmon, who was paralyzed earlier, came in and stopped it with his mace-microphone. Shoutmon: You wanna know? What you said got me so pissed off that the pain just went away! Bad Boss: The entire leadership of the Bagra Army consider their troops so expendable that they'll kill them over minor slights or for quick boosts in power. Badass Normal: Taiki did a judo-drop on a Hangyoumon. And then, in episode 22, he attacked an Arkadimon. Using a ball-of-chain on his legs. While swimming in digital space. While not as amazing as the previous one, Akari managed to defeat other MantaRaymon with her gaming skill. Bash Brothers: Shoutmon and Ballistamon. Once they ally together and learn to Double Xros, Taiki and Kiriha start giving off this vibe. Belly of the Whale: In the fifth episode, Taiki and Shoutmon are swallowed by KingWhamon, whose body makes up the entire Island zone. Inside, Shoutmon is poisoned by the Bagra army's Flymon, but Taiki's courage reaches KingWhamon, saving them and earning them the Code Crown...as well as Shoutmon's salvation and a set of DigiMemories. Once again, they did it on a different Whamon in episode 38. Beyond the Impossible Shoutmon X7 Superior Mode is Beyond the Impossible The Digimon. Given that hundreds, if not thousands of Digimon joined the Final Xros, it's likely that Shoutmon X7 Superior is the strongest Digimon to ever exist. To put this in perspective, X7 Superior Mode contains, among other things, two members of the Royal Knights, three members of the Olympus Twelve and two of the Demon Lords! This alone would be enough to bring him far but it's still only a small portion of him! BFS: Tactimon's Jatetsufūjinmaru. Which he hasn't even taken out of its sheath yet. According to official info, the main reason he hasn't taken the sword out is because it has power sealed within it strong enough to break a star in two. Big Badass Wolf: Dorulumon. There might be a chance that he will follow the footsteps of Garurumon. Biological Mashup: DaiPenmon and IceDevimon's combined form in episode 11 looks like this as opposed to the other combinations. Bloodless Carnage: Not because there is blood, but rather, off-screen violence. 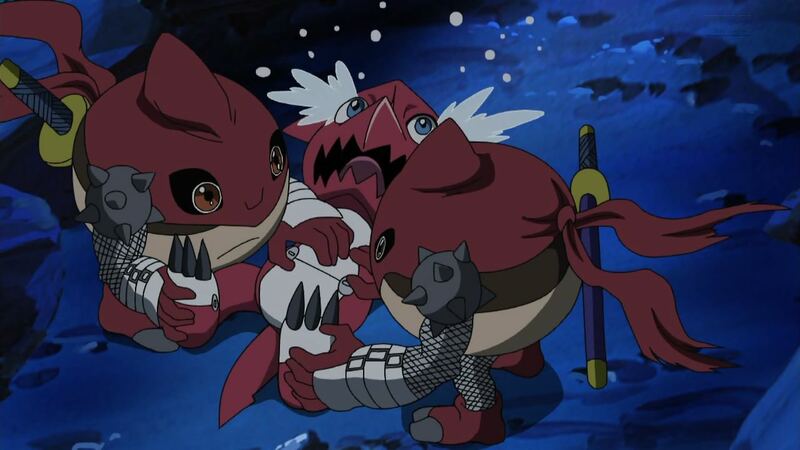 In Episode 18, Lilamon and Stingmon were taken care of by Kiriha's MetalGreymon off-screen. We just see them downed and injured. Bluff the Impostor: In episode 39, Kiriha suddenly remembers to return a Digimemory he borrowed from Taiki, and Taiki agrees. Except that the borrowing never happened, and Kiriha hands over a small explosive device that ruins Splashmon's impersonation of Taiki. Body Horror: Gravimon's core when situated within Taiki's arm. Boisterous Bruiser: Shoutmon. Unique in that he's this series' equivalent of a Child Level (And just as mature). Boke and Tsukkomi Routine: Akari and Nene of all people do one (at Nene's suggestion no less) to earn the Code Crown for the Shinobi Zone. Guess what? It worked. Book Ends: The image of Taiki, Shoutmon, Ballistamon, and Dorulumon from Taiki's dream in Episode 1 is recreated right before the Final Xros in 54. This time, however, the boys have got everyone else backing them up against Bagramon as well. Bragging Theme Tune: the insert songs. Brainwashed and Crazy: Anybody hit by EBEmon's attack, including the main Xros Heart Digimon and the warriors of the Goddess. Breaking the Fourth Wall: In episode 18, Blastmon mentions "finally reappearing in this show". Breather Episode: Shinobi Zone. It also serves as an episode to have Nene warm up with Xros Heart. Calling Your Attacks: Complete with subtitles... and Shoutmon always, ALWAYS yells his attacks! Catalogs and Magazines Always Spoil: The merchandising for the show as well as the various Jump magazines and fliers showing future Digimon appearances and DigiXros combination. Additionally, the promotions for Digimon Xros Wars the Young Hunters Leaping Through Time made it abundantly clear that Shoutmon wasn't permanently killed off in episode 53. Catch Phrase: "I just can't turn my back on him/her!" (In Japanese, hottokenai!) Initially the catch phrase of Taiki, it eventually becomes the collective catch phrase of Xros Heart. Channel Hop: From Fuji TV, longtime home of the Digimon franchise, to TV Asahi. Possibly justified because of what was occupying the traditional timeslot. Cloudcuckoolander: The Monitamon. Blastmon definitely counts as well. Conspicuous CG: In Taiki's dream in the first episode, when Shoutmon X4 was blasting the Bagra Army was his Three Victorize attack, he and the power beam were rendered in CG. In the show as a whole however, this is largely averted for the first time in Digimon. All of the evolution scenes are CGI-free, when in previous series there was always at least two evolution scenes done in CG. Cooking Duel: Sweets Zone involves this. Cool Sword: Starmon and the Pickmon can combine into one of these for Shoutmon or Zenjirou. Lampshaded by Shoutmon after X4 defeats AncientVolcamon and restores Magma Zone. Then Tactimon shows up and blows everyone away. Curb Stomp Battle: The very first fight against the Bagra army isn't challenging at all. Episode 19. Xros Heart faces a massive army of GranKuwagamon, who would be Mega (Ultimate) Digimon in a normal series. How long does this battle take? About 10 seconds. Taiki DigiXrosses Beelzebumon and the Starmons, forming the Meteor Cannon, which takes the whole army out in one spread-shot blast. Tactimon vs OmegaShoutmon. Tactimon gives it his all, but can't even land a single hit on him. Even his ultimate attack is blocked with ease and leaves him wide open for OmegaShoutmon's Beat Slash attack. Shoutmon X7 Superior Mode vs. MegaDarknessBagramon, in the most epic way possible. That is all. Joke Character Bastemon does one offscreen to ChuuChuumon in episode 53. Bastemon: When I see that Digimon, I somehow feel... very cruel! Dancing Theme: The second opening has Cutemon and Dondokomon dancing through the whole thing. Dark and Troubled Past: Baalmon. My god. Yeah, having to kill all your brainwashed allies and your mentor Angemon in cold blood will definitely haunt you for life. Darker and Edgier: The Seven Kingdoms arc was this to the first half of the series. Dark Is Not Evil: If Omegamon's reveal is to be believed, Darkdramon, Impmon and Leviamon (the Demon Lord of Envy no less) were actually heroic Digimon who helped him protect the Digital World, as his group were all turned into Digimemories in a failed attempt to prevent the Digital World from breaking up and those three are among them. Death Is Cheap: Baalmon again. He takes the full force of HiMugendramon's attack and gets a really dramatic death-scene... Then he gets reborn. As Beelzebumon. Less than a minute after his death. In other words, his death had absolutely no negative effects whatsoever. Note that with the exception of above, death is quite common in this series. However, it is revealed in episode 29 that death is not permanent for any digimon, as their souls endure even when their data is deleted. It always takes some special circumstances to restore them to life, such as Baalmon's upgrade to Beelzebumon or MadLeomon's extremely belated reincarnation as Leomon in Episode 29. AncienctVolcamon and Neptunemon are also revived then, and it assumed that other zone bosses, such as GranLocomon, were also revived and turned good. It gets worse in the second arc. Episode 50's preview indicates all the Death Generals are coming back, and descriptions for future episodes suggest they may even switch sides. And while Deckerdramon and Beelzebumon made epic heroic sacrifices, Kiriha commented that he wants to get the Code Crown so he can revive Deckerdramon, which implies they can still be brought back. As for Damemon, who dies in episode 49, he gets revived in Young Hunters as Yuu's partner. Defrosting Ice Queen: Akari ends up defrosting Nene in episode 23. Determinator: Sparrowmon in episode 17. All of Xros Heart in episode 29. They've just been hit by Tactimon's ultimate attack, and are held to the ground by the continuous pressure the attack causes. Then they just force themselves up with pure willpower, each delivering their own part of a collective In the Name of the Moon speech before completely breaking through the attack. Dinosaurs Are Dragons: As is typical with this franchise, Greymon. Does This Remind You of Anything? : MailBirdramon's DigiXros with Golemon replaces his tail with a long, rock hard one with Golemon's head at the end of it. Cyber Launcher. It looks like MetalGreymon is firing something from his giant, metal... cannon-thing... on his groin! Dropped a Bridget On Him: Cutemon, the Pink, Scarf-wearing Healer is a boy. Elaborate Underground Base: Magma Zone has this slave camp, and Sweets Zone has this giant shredder where wastes are taken. The latter also holds Breakdramon and the various Digimon it is feeding from. The Empire: The Bagra Empire, of course. Even Evil Has Standards: Lilithmon is prepared to cut off Akari's hand to get the Code Crown in episode 11. IceDevimon shudders at that idea. Everything's Worse With Penguins: In the Lake Zone, Lillithmon unleashes DaiPenmon, a giant, evil penguin wielding enormous popsicles. Then he gets worse. Everything's Worse With Samurai: Tactimon: Highly strategic, dangerously lethal, and an adversary to the heroes. Also shown to be more than just competent in combat by himself, if knocking around the heroes with a giant katana without unsheathing it is any indication. Everything's Worse with Bears: Sweets Zone is full of Monzaemon and its variants. Averted earlier in the series with Bearmon. Then played straight again with the Bagra Army's employment of Grizzmon, the evolved form of Bearmon, as soldiers. Evolutionary Levels: Subverted. Unlike previous series, every Digimon from the introduction of Xros Wars onwards are lumped into one level, which the Digimon Dictionary calls "Digimon introduced in Xros Wars"; most fansites refer to such Digimon as having "no defined level". Most types of evolution that the enemies use rely on the similar "jogress evolution" technique, making them look like DigiXroses as well. Then played straight in Episode 30 when Shoutmon finally got the ability to evolve into OmegaShoutmon. Note that evolution in this series is treated more like age rather than a power-up, and that OmegaShoutmon is Shoutmon's "future-self accessed temporarily with the help of Akari and Zenjiro". However, this "future" reason is played very inconsistently - accordingly ZekeGreymon would be MetalGreymon's future form... except MetalGreymon is just a DigiXros, not a single Digimon in and of himself, and so he would not be able grow up to eventually become ZekeGreymon. Unless of course, you consider ZekeGreymon being the future form of the Xrossed future Greymon and MailBirdramon. Justified since the previous seasons worked this way as well. The Heroes are just able to temporarily allow their partners to access these future forms. For example, Tailmon/Gotomon's default form is Adult/Champion, as opposed to Child/Rookie due to her experiences. Excited Episode Title: All of the titles. All of them. Expy: Dorulumon gives the impression that he's Digimon's version of Tiger. They look similar and have almost similar attitudes. And it seems like he shares the same fate of Tiger of the Wind and Greywolf from the anime. Dorulumon was once a general of Tactimon much like Greywolf is one of the servants of Moo, and that Dorulumon serves as a temporary guardian to Cutemon until he finds its parents is similar to how Tiger treats Greywolf when they were young. Oh and the fact that one episode is labeled "Dorulumon, Run Like the Wind". As far as previous series are concerned, Baalmon may count as a Composite Expy, sharing traits with Wizardmon including his Taking the Bullet moment, as well as with Beelzebumon to the point that his reincarnation turns him into an updated version of him. Kiriha's early characterization and character design have led to many claiming he's this to Neo Saiba. Tyutyumon and Damemon bear particular resemblence to Chuumon and Sukamon. Except, you know, not nearly so ditzy. Yuu is a young prodigy with death issues who was granted a black digivice by an evil digimon, who allowed him access to the digital world and manipulated him under the premise that the entire world is a game. He became excessively cruel because he thought that the digimon weren't real, and only realized the truth after physically tussling with the heroes and seeing his Morality Pet die. Ken Ichijouji would like to have a word with him. Exty Years From Now: The series (or at least the manga) takes place in the year 20XX. Foreshadowing: Most interestingly, certain major plot events are foreshadowed in the lyrics of the insert songs- for example, "We Are Xros Heart" uses the term "Great Xros" in its lyrics. Naturally, this is the phrase shouted to form Shoutmon X7. Also, "We Are Xros Heart ver. X7" feature the lyrics "The world is one! Yes! We are one!" and "Now everything will fuse as one into a Great Xros! Give me everyone's shining souls! ", which in hindsight pretty clearly references Shoutmon Xrossing with every Digimon at once in the final battle. You'd be forgiven for missing out on this since it sounds like traditional shonen lyrics, and the song is pretty rockin'. Forgotten Phlebotinum: Whenever Sparrowmon isn't around, Taiki doesn't have the material needed to boost Shoutmon to X5, so in such cases he pulls out X4 instead. Why he stops at X4 instead of adding Knightmon for X4K or Beelzemon for X4B is unclear. Similarly, Beelzemon can be crossed with the generally-unused Deputymon for more firepower, but this particular cross has only been used once. Kiriha actually has the fairly sizable infantry of the Blue Flare Army stored in his X-Loader, but he seems to rely almost exclusively on Mailbirdramon and Greymon's crossed form, with the occasional sighting of Deckerdramon and Cyberdramon when MetalGreymon isn't available. Floating Continent: All zones were once part of a whole Digiworld, but now exist as islands floating in a digital plane. Full-Name Basis: Zenjiro addresses Taiki this way until episode three. Still calls him by the full name once in a while though. Funny Background Event: Since DigiMelody segments, there have been various background events that can be missed if you don't notice it fast enough. For instance, episode 25 features an oni Zenjirou (as it was aired during a celebration in Japan). Fusion Dance: Similar to Digimon Adventure 02, this series's Children or generals have the ability to "DigiXros" Digimon (merge them) using the new Digivice, the Xros Loader. Digimon from the Bagra Army do the same, except that the fusion is forced and the non-main components are destroyed and absorbed. Kiriha's and Taiki's Double Xros seems to be a better example of this trope. Gas Mask Mooks: The Bagra Army's Troopmon. Strangely enough they look like Pyro. Giant Enemy Crab: Ebidramon, a giant lobster dragon thing. And yes, Taiki attacked its weak point steamrolled it For Massive Damage. With a summoned LEVIAMON. Goggles Do Nothing: After Masaru declined them, Taiki resumes their traditional use. Grand Finale: Boy, is it ever. Gratuitous English: Most of the Digimon's attacks, as usual. Taiki often says, "Thank you," and Starmon calls all the guys "brother." Green Lantern Ring: The Xros Loaders can merge Digimon into any tool or weapon necessary - hammers, axes, swords, shields, slingshots, helicopters, etc. Hand or Object Underwear: Taiki and Zenjiro use Starmon and the Red Pickmon, respectively, to preserve their modesty while in an onsen. And Baalmon. He got better though...and then sacrificed himself again thirty-four episodes later. And as of Ep 43, Deckerdramon too, although he was already dying. Apollomon also does this to send Taiki and gang and Olegmon out of Prison Land. Heel Face Turn: Baalmon, Nene and Kiriha. Highly-Visible Ninja: Monitamon. This trope might as well be outright invoked with Hi-Vision Monitamon. Neptunemon is done in by his own spear. GranLocomon is defeated with his own attack when Shoutmon X4 gives it a return address. Olegmon is defeated by Ballistamon's Ultimate Speaker, a sound-based weapon he installed in DarkVolumon, to enhance the destructive power power of his voice. Bagramon in the final episode. To clarify, Bagramon stole the Code Crowns at the end of the first half of the series. Through the second half, he is seen converting it into the Dark Crystal for D5. However, when Taiki enters the Dark Crystal, he manages to revive Shoutmon, Belzeebumon and the other dead digimon. As Shoutmon explains to Bagramon, the Code Crowns were never his, as they have been united by by Taiki in the first place(the requirement for ownership). The Code Crowns then allow Taiki to Digixros Shoutmon and the rest of the good Digimon into Shoutmon X7 Superior Mode, which then promptly curb-stomps Bagramon. Hope Spot: Episode 29 ends with Taiki and the others defeating Tactimon, the toughest of the Bagra Army's three generals. Tactimon's gone, all of his Code Crowns are there for the taking and then...Bagramon reaches through a dimensional portal, snatches up all of the Code Crowns, causes a reality rending whirlwind that knocks Shoutmon, Taiki, Akari and Zenjiro back to the human world! Talk about an emotional 180. Hot-Blooded: Shoutmon for character type, AncientVolcamon for both character type and literal application. Humiliation Conga: This happens to DeathMeramon in the Magma Zone arc; he goes from being a Badass that trounches Shoutmon X2, to being beaten by Shoutmon X3, Shoutmon X2 (who he'd defeated before), and is then finally taken out by Shoutmon alone after being wittled down by his previous defeats. Episode 10-11 are dedicated to this on IceDevimon. "I Know You're in There Somewhere" Fight: Taiki punches Kiriha to snap him out of DarkKnightmon's control. Shoutmon is great at these: He intentionally had himself crossed with NeoVamdemon to talk to the remnants of MetalGreymon, who he had absorbed. He does it again later with Ballistamon to snap him out of his short stint as Dark Volumon. Idiosyncratic Episode Naming: Early titles contain a noun phrase, comma and a verb (phrase). "Shoutmon, Roar!" Improbable Weapon User: Shoutmon fights using a microphone as a bludgeon. Simple Staff: In the Digimon Dictionary, it is stated that he performs boujutsu with his retro microphone. Incredibly Lame Pun: Notably, a storm of these was how Xros Heart got Karatenmon to give up the Code Crown he guarded. And who rattled off this storm? Nene. Ineffectual Loner: For the first time in the entire Digimon run... averted. Yep, what fans usually nickname the "lone wolf" is absent this time (Zenjiro doesn't even come close this series). Kiriha would be closest, but he's a villain, and nobody would call him a loner per se. Dorulumon may have been similar to this at the beginning, but even then he was a Papa Wolf to Cutemon, and has since become used to working with the rest of Xros Heart. It's played a little straighter in the Death General Arc with Kiriha, who is definitely no longer a villain. Internal Homage/Mythology Gag: A kind of cross-series Laser-Guided Karma version. Baalmon is an Expy of Beelzebumon, and Lilithmon kills him by stabbing him in the stomach with her claws. How did the original Beelzebumon kill Leomon? By stabbing him in the stomach with his claws. It is undeniably intentional after Baalmon is reincarnated as Beelzebumon. Pinocchimon gave Taiki the MetalGarurumon DigiMemory after being taught trust and friendship. In Digimon Adventure, MetalGarurumon killed Pinocchimon, who in his last words still couldn't comprehend the idea of trust and friendship. In the very first episode, some of the Digimon in Taiki's dream sequence are Agumon, V-mon, Guilmon, and Agnimon. It Only Works Once: DigiMemories... or once a Zone. That said, only one or two DigiMemories have been reused, probably to allow maximum exposure of new ones for Call Back value. Irony: Pinocchimon has MetalGarurumon's DigiMemory. It's one heck of a meta-level irony! Joke Character: Literally. Taiki ends up producing several random and absurd DigiXros for the sole purpose of making Karatenmon laugh. Lethal Joke Character: And then BalliBastemon (Ballistamon + Bastemon) ends up taking out a whole squad of Etemon. Taken to ridiculous levels is GCutemon in which he obliterates an entire legion of Gravimon's army. Kraken and Leviathan: Episode 4 has a more mundane example in the form of Octomon. Then episode 5 has Taiki summon Leviamon, which is a more straight example of this trope. Killed Off for Real: Deckerdramon and Beelzebumon (nope, he didn't just turn into something else the second time). However, the Code Crown revived them in the finale along with Shoutmon who got killed in the penultimate episode. Laser Sword: The Rare Star Sword, formed when it includes the red Pickmon. And specific DigiXros songs for X4, X4B, and DarkKnightmon. Beelzebumon has a chime that plays, accompanied by a falling feather, before he shows up. It's probably not his DigiMelody. Light Is Not Good: The Heaven Zone, despite the angelic trappings, is run by a police force that's not afraid to execute people in front of large crowds. Justified that they need to be extremely artistic and good to keep the Dark Temple locked, and it is explained that the Zone became tyrannical due to the influence of the small amount of darkness that seeped out. Loads and Loads of Characters: One of the largest casts of any Digimon iteration, if heavily prone to Out of Focus. The Sparrowmon component of Shoutmon X5 is a shield... with GUNS! Master of Disguise: Nene has a number of digimon disguises in the early portions of the Death Generals arc. Meaningful Name: Zenjiro Tsurugi; he happens to practice Kendo. And what's the biggest way he's helped Xros Heart so far? Attacking Digimon with swords. Mecha Expansion Pack: Some Digimon serve this purpose when DigiXrossed instead of an outright composite merger, such as Golemon for MailBirdramon, ChibiKamemon for Shoutmon X2, Knightmon and the PawnChessmon for Shoutmon X4, and Wisemon for both Mervamon and Knightmon. Mega Neko: MadLeomon; a giant, undead neko. Men Don't Cry: Cutemon insists that he won't cry in episode 28, because boys don't do that. Akari, under Lilithmon's control in episode 11. Those who are affected by EBEmon's attack too. Kiriha at the end of ep 20. Taiki snaps him out of it in the next episode. Episodes 40 and 41 use the swirly-eyed version for the Digimon under Olegmon's control. Almost all of Taiki, Kiriha, and Nene's Digimon get controlled at some point, as well as three old friends Spadamon, Lunamon, and Coronamon. Misguided Missile: Neptunemon's spear, which doesn't stop until it hits it's target. In the end X4 jumps behind him and Neptunemon gets hit. The Mole: Baalmon joined Bagra Army to find out who killed his friends and the one who destroyed the ancient civilization in Sand Zone. Lucemon was revealed to be this for Lilithmon. Damemon is actually working for DarkKnightmon. In episode 6 the Xros Heart team are in a very tough situation, where they're surrounded by Neptunemon's army, which holds Archelomon hostage. How do they save him? By summoning MarineAngemon which distracts the Bagra army with love. Hows that for mood killer. In episode 17. In the middle of the most dramatic part of the episode, Taiki summons Patamon to make puffy, white clouds for Shoutmon X4 to walk across accompanied by squishing noises. Way to kill the mood, guys. Note that they didn't even play the DigiMemory music when summoning Patamon, so it was really quite... off. Tropes Are Not Bad. It works really well in episode 25, as despite the hectic and intense battle, Blastmon's... er... mentality shines through. Morality Pet: Sparrowmon for Nene. Mundane Utility: Digimon attacks... used for cooking! New Powers as the Plot Demands: Averted by the DigiMemories. They may seem to be random Digimon that just happened to have the exact power the heroes need to get out of their current fix... until you realize that the attack is already labeled on the item itself. Taiki most likely have read their names and could guess what they could do. Possibly used when Shoutmon X4 fights Gran Locomon: He can suddenly fly, -backwards-, as fast as a speeding train. Nice Hat: Cutemon's father's top hat. Nice Job Breaking It, Hero: Yeah, let's get the guy who's literally named after the Judeo-Christian Satan elected as president of a key area! What could possibly go wrong? Did we mention he was the Big Bad of Digimon Frontier? After they elect him leader, Lucemon immediately reveals his true, evil form and starts doing destructive, evil things that take two more episodes to sort out. Ninja Pirate Zombie Robot: the LadyDevimons in Vampire Land are partly undead, who are apparently vampires too, and demons! No Conservation of Mass: Averted in the Final Battle. After the appearance of Shoutmon X7 Superior Mode, DarknessBagramon rips the surrounding material apart and consumes it to grow to a similar size. Doesn't help him, but points for the thought. No Kill Like Overkill: Taiki unleashes the power of Leviamon on an Ebidramon. Kiriha does this in episodes 19 and 25, in the latter case getting called out for the excessive damage to the surroundings (the zone actually becomes uninhabitable, forcing Taiki to evacuate the locals to another zone). Not So Different: Akari spent most of the time annoyed at Taiki's efforts to help Nene, but after hearing Nene's anguished cry in episode 19, Akari realizes that Nene's desire to return home is just as strong as her own. Akari then becomes a close friend to Nene. Oblivious to Love: Ah, poor Lilamon! Stingmon just doesn't get it! Though by the end of episode 19 they seem to be together as both are blushing and embracing. Obviously Evil: DarkKnightmon; do we even need to point this out? That guy is a villain trope jamboree! Fascinated with the Darkness, as well as having "Dark" in the name; taken after a Black Knight, and the Skull symbol in case of its un-Xrossed form; ruthless towards his opponents anyone in his way; does not hesitate to order his "General" around, even tormenting her a little from time to time as well as having a blackmail advantage over her; speaks in a subdued yet confidently villainous tone; and last but not least, he's not shy about letting people know about it. Even his theme song is called "Dark Kight ~The Immortal Ruler~". Subtle, he ain't. And of course, at the end of #20, he shows up to confront Xros Heart along with SkullGreymon and - get this - SkullSatamon. Ojou: Nene certainly acts like one. Omake: A Monitamon tells us about one of the series' Digimon at the end of each episode (later replaced by a Digimelody following the info of each mon). One-Hit Kill: Shoutmon X7 Superior Mode vs. DarknessBagramon. One stab is all that was needed. "On the Next Episode of..." Catchphrase: "You can't turn your back on the next episode either!" Only Barely Renewed: Apparently Xros Wars during its initial airing Digimon Xros Wars started off with good ratings, but as the season tapered on its ratings began to fall, giving this season some of the lowest ratings in the history of this franchise, however it had good toy sales, so it was allowed to continue for a second season, which ended up doing even worse than its predecessor. Original Flavor: The art style is at least more faithful to Digimon Adventure and Digimon Adventure 02 than Digimon Tamers, Digimon Frontier, and certainly Digimon Savers. Additionally, despite its significantly different premise, it was intended to be generally evocative of Adventure in numerous aspects, most notably Agumon's seiyu Chika Sakamoto returning to voice Shoutmon, the new lead Digimon. And that's to say nothing about how similar Taichi and Taiki are. Our Hero Is Dead: Shoutmon is killed in episode 53, but is revived in the finale. Our Mermaids Are Different: Neptunemon, one of the Bagra army's commanders. And later Mermaimon, Olegmon's second-in-command. Out of Focus: Aside X7's component digimon, members of X Heart and Blue Flare rarely get any spotlight episodes after their introductory arcs. The less combat-capable members, such as Jijimon and Chibikamemon, barely appear at all. Paper-Thin Disguise: Taiki and Nene are able to pass themselves out as vampires to some LadyDevimons wearing only black masks and cloaks while wearing their regular clothes. 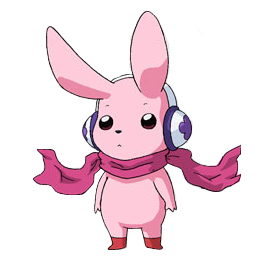 They also disguised Cutemon as a Lopmon with only his ear-shaped antennae as the only difference. Plot Coupon: The pieces of the Code Crown. Poor Man's Substitute: Blastmon's voice actor, Daisuke Kishio, sounds like he's trying to imitate Norio Wakamoto; it's actually impressive, considering how his voice comes quite close to Wakamoto's. The Power of Love: Deckerdramon joins Kiriha's team because he has the strongest love out of all the kids there. Power Trio: Taiki (ego), Akari (superego), Zenjiro (id). Later Nene (ego), Taiki (superego), Kiriha (id). Police State: The Heaven Zone under SlashAngemon. Punctuated for Emphasis: GET! BACK! GOOD! WORLD! XROS! HEART! Purely Aesthetic Gender: Averted once again since Tamers' famous proclamation about the relevance of gender. Gender-specific pronouns, Digimon couples, Digimon flirting with each other, and Digimon babies (not Baby-level Digimon) -- yes, gender exists this time. He shows up again in #26, so he's still shifting in whenever the plot calls for x4B or x5B. Nene and Sparrowmon are pretty much commuting to work at this point, though they show up in episodes 27 and 28 as well as important to the episode's plot. As of episode 30, this was Akari and Zenjiro's fate until the end. Everyone except Taiki, Yuu, Damemon, Shoutmon, and the core members of Xros Heart were put on one for Young Hunters. The Bus Came Back briefly for Akari, Zenjiro and Nene early on, but it's not permanent. Reincarnation: This is what happened to Baalmon so he could become Beelzebumon. The Death Generals get a very perverted form of this, except Apollomon and Olegmon who get properly revived. Reality Subtext: Perhaps a side affect from so many shout outs but there are four rival armies, three have an expy of another mon series at their head while one has franchise mainstay Greymon. This doesn't have relevance in the plot but it is amusing. Repeat Cut: In episode 1. "DigiXros! DigiXros! DigiXros!" And when Taiki declared his name when getting his Xros Loader. ChibiKamemon, a tinier wide-eyed version of the Savers incarnation. Also, Archelomon in an friendly forgetful grandfather sort of way. Rule of Three: Most of the individual zone arcs take up three episodes each. The exceptions so far are the Lake Zone and Forest Zone. There are also 3 human generals and 3 Bagra Army Head Officers. Running Gag: During the recaps of the first arc, there's always a "Relationship map" that shows the three hero armies and the Bagra Army doing whatever they did last episode, exaggerated to the point of hilarity (IE: Episode 7, which follows Kiriha trying to recruit Taiki, has him sitting in a corner, looking at a drawing of Taiki with the words "Mine" on it with love hearts). This leads to a mini Crowning Moment of Funny when a rescue attempt leads to the damsel in distress in question being shown as being tug-of-warred by her hair. In turn, there's a running gag in this where characters who don't show up are represented as being in their rooms, with increasingly large piles of trash out front. If Taiki is about to collapse, Akari grabs the nearest thing and throws it under his head to cushion the blow. Including a pillow, Shoutmon, and Dorulumon. Any Digimon related to Lions die... as per usual. Mad Leomon is killed off in Ep 3 [Later revived as a Normal Leomon, who actually does not die, as he can be seen for a moment in the final episode]. Apollomon, another anthropomorphic lion, dies TWICE, both times viva Heroic Sacrifice, in true Leomon fashion. Scaled Up: MadLeomon tried this by merging with Orochimon in episode 2. Screaming Warrior: Shoutmon does this, though it's justified because his name is Shoutmon. Sea Monster: As you might expect, the Island Zone arc is filled with these, both evil and benign. Sealed Good in a Can: Turns out that the Digimemories are actually a group of heroic Digimon who tried and failed to stop the Digital World from breaking up and were sealed in them as a result. Omegamon explains this from within his own Digimemory. Serial Escalation: How much fiery passion can Shoutmon summon? What cunning scheme will Taiki employ? How many Shout Outs to previous Digimon series, Super Robot Genre shows, and other works will be made? How many Digimon can be combined into one DigiXros? Shinigami: What the other generals call Baalmon. Shout-Out: Just check it out! Shoo Out the Clowns: Only Taiki and Shoutmon are able to go back to the Digital World. Shut UP, Hannibal: In episode 47, SkullKnightmon taunts Nene about how much she helped him and how she fell completely for his plans, stating that not even learning how to DigiXros Shoutmon X5 would be enough to stop him. How does she respond? By stating that it's not X5 he just defeated, but X4, leading to Sparrowmon swooping down, cold-clocking SkullKnightmon, and then reforming X5 to hand SkullKnightmon some well deserved payback. Silly Love Songs: The music in the LOVE-LOVE DANCE, much to the embarrassment of Beelzebumon, Dorulumon, Cutemon, Revolmon, and a lone PawnChessmon. Single-Stroke Battle: Versus Grademon in episode 29. Bagramon - even in his final form - against Shoutmon X7 Superior Mode. Sitcom Arch Nemesis: Zenjiro acts like this to Taiki in the first episode. Somebody Else's Problem: Taiki insisted that trying to become Digimon King was something Shoutmon had to do on his own, until he learned he was doing it to help save the Digital World. Though this is an aversion; Taiki will help someone when they need it, but only if it's something they can't do alone. He didn't want to help Shoutmon because he didn't want to endanger his other two friends, and thought Shoutmon was simply being selfish at first. Spell My Name with an "S": Dorurumon or Dorulumon? Considering that his name hails from doriru and garuru, it's just like Garuru/Garulu again! Initially, there was confusion as to whether the antagonist army was named "Bagura", "Bagra", "Vagra", or even "Bugra". "Bagra" won out in the end. Valvemon or Bulbmon? It was Bulbmon in the localization of Digimon World 3, but its name can be correctly romanized either way. "Valvemon" makes more sense, though. A few Digimon's names are spelled wrong in the Xros sequences (for example, Dorulumon is "Dorurumon"). Spoiler Title: This series was really bad about this. Not just the titles, but also the story narration lines in the corner that they added starting from the Disc Zone episode. One example: in episode 48, "Goodbye, Beelzebumon!" As if the title didn't give enough away. Stock Footage: As with any Digimon series. It's a bit more conspicuous here, however, such as in episode 4 when the entire Shoutmon X2 and Star Axe sequences were used twice in the same episode. However, it was lampshaded by a comment from the Pickmons the second time around. Strange Minds Think Alike: Flowerpowermon! Straight Mon: You can see which Digimon aren't into hilariously embarrassing scenes in the Love Love Dance sequence - notably Revolmon, Beelzebumon and Dorulumon. Dorulumon especially. In episode 23 he is the only one who didn't participate in telling jokes, pretty much going "screw this, I'm not telling a joke!" and drilling the ground to hide. Note that smiling and laughing isn't above him, he just doesn't want to participate in rather embarrassing situations. Summon Magic: The DigiMemories are basically this. The evolution level of the Digimon seems to reflect the strength of the summon. Take Over the World: Played with in that this is the goal of the protagonists in addition to that of the Bagra Empire. MadLeomon tries this in episode 3. He's destroyed before he goes boom. Neptunemon attempts this as well, by trying to drown Taiki, Zenjiro, and Shoutmon X4. A Taste of Power: The Leviamon DigiMemory. Theme Music Power-Up: Taiki and Kiriha get this when they DigiXros their mons. This is the first series where different characters have their own "evolution" theme; Taiki gets three. This Is a Drill: Dorulumon, of course, and Shoutmon X4, who attacks with the drill he gets from Dorulumon. Strangely enough, Dorulu Cannon doesn't have drill attacks. Three Plus Two: Taiki, Akari, and Zenjiro make up the trio; while it initially seems that Kiriha and Nene will make up the two - and they do - by the time Kiriha joins, Akari and Zenjiro have permanently returned to the real world, so they're not the three anymore. Throwing Your Sword Always Works: Zenjiro kills a buried Drimogemon in one hit by throwing the Rare Star Sword at it. Time Skip: Since time flows faster in the Digital World this happens to all the characters left behind there during Taiki's return to the real world. Toyless Toyline Character: Sort of - OmegaShoutmon, ZekeGreymon and Shoutmon DX were quite obviously designed in such a way that hypothetically toys of the former two could be easily combined into a Shoutmon DX figure while retaining all the parts, and yet no such toys ever materialised even though they're all very important. Tragic Keepsake: Somehow, Mervamon got a hold of one of Beelzebumon's feathers after his death (odd because it should have disappeared with the rest of his data). She's seen frowning at it in the next episode, but it's not clear whether or not she keeps it. Transformation Sequence: So far the longest is a solid 1:30 to reach Shoutmon X4! True Companions: The whole theme of Xros Heart and pretty much the whole show. Unity of Digimon is important, and this is what Xros Heart differs from other armies, compared to the Bagra Army or to Blue Flare. Taiki respects Digimon as the other Digimon respect each other. The DigiXros has a "heart". Compare it to Bagra Army who have no qualms in killing their own men, due to the We Have Reserves mentality, and even absorbing the smaller mooks. Or to Blue Flare, which Taiki felt "has no heart", and Kiriha seems to only interested in recruiting strong Digimon and abandoning the weaker ones. Tsundere: Mervamon appears to be this, especially with Beelzebumon. And it is properly Lampshaded by Shoutmon. Turtle Power: ChibiKamemon and Archelomon. Turtle Island: Despite the above trope applying to its inhabitants, the Island Zone is actually the body of KingWhamon, a more massive, white-colored version of the familiar beast from previous Digimon series. The Undead: The Raremon residing beneath Sweets Zone, who were villagers that had their data taken out. All they can say is "Data!" Thankfully, they returned once Breakdramon has been defeated. Green Zone is both the Green Hill Zone and the First Town. Palmtree Panic: Island Zone, with a dash of Underwater Ruins and Down the Drain. Lethal Lava Land: Magma Zone. Medieval European Fantasy: Lake Zone. IceDevimon's presence converts half of the Zone to a Slippy-Slidey Ice World. Shifting Sand Land: Sand Zone, which also counts as Temple of Doom and Minecart Madness. Digital Space Level: the "rift" between Zones where they fought Arkadimon. The manga also features Snow Zone (Slippy-Slidey Ice World) and Sweet Zone (which later appears in the show). In the next arc upon Taiki's return to the Digital World, the Zones have united and have become lands. Verbal Tic: Several minor Digimon have one, either parts of their names (Cutemon's "~kyu", PawnChessmon's "~chess", Evilmon's "~evil", etc.) or the animals they resemble (Archelomon's "~kame"). Also, Jijimon and Archelomon talk like older men, adding "nanoja" to the end of their sentences. Viewers Are Goldfish: Most episodes, especially ones in the first half of the series, had captions placed in the corner throughout them explaining what was going on for some reason; episode 25 was a particularly big offender. Yeah, thanks, we totally wouldn't have figured out that Shoutmon had fallen into a hole had you not added a caption explaining it to us. Visual Pun: You know, Stingmon is a (humanoid) wasp/bee - with a giant stinger on his arm, no less - and Lilamon is a (humanoid) flower. Insert lame pollination joke here. The Voice: Lord Bagramon until episode 21. War Elephants: The final battle, which features hundreds of Mammothmon serving under DarknessBagramon, stands out as a particularly noticeable use of the trope. Wave Motion Gun: The Meteor Cannon, a Xros between Beelzebumon and Starmon. Wave Motion Tuning Fork: Beelzebumon's Berenjena SDX. We Can Rule Together: Early in the series, Kiriha wanted Taiki to join as his subordinate and made this proposal fairly frequently. Nene later proposed this to Kiriha and forced him into it. When all three were finally working as a team, quite a few of the Death Generals made this offer. We Have Reserves: The Bagra Empire is willing to sacrifice its less powerful soldiers in order to power up the commanders. Or just destroy them to make a battle end faster. Well-Intentioned Extremist: The police force of Heaven Zone. SlashAngemon admitted that he tightened rules originally to prevent the Bagra army from disrupting the peace. Wham! Episode: Episode 13. Baalmon used to be a holy warrior who was forced to murder his brainwashed comrades by Lilithmon. And then she critically wounds him after he finds out it was her. Wham indeed. Episode 29. Some events were spoiled, like the trio and Shoutmon being thrust into the Real World, but what caught many people off guard was DarkKnightmon called Bagramon BROTHER! Whole-Plot Reference: Episode 5 isn't the first time Digimon characters have gone looking for a Plot Coupon inside the belly of a Whamon. Not to mention having many similarities to an arc in Digimon V-Tamer 01 as well. The Vampire Land arc is a reference to the Vamdemon arc in Digimon Adventure, complete with an Expy of the man himself, NeoVamdemon. Who's on First? : Toei played with English pun on Yuu's name in episode 49. In the flashback to when he met Damemon, Damemon asks for his name using the word "you": YOU no namae wa? So when Yuu answers, it takes a moment for Damemon to get it. Eh, YOU no namae wa Yuu? OH AMAZING! The funny thing is the dubbers will have to figure a way around this anyway. Wild Card: Kiriha looks to be in this position. Wise Beyond Their Years: Taiki, Kiriha, Nene, and Yuu are more mature than most adults. Wolverine Publicity: Beelzebumon was hyped to space and back -- a card set named for him ("Beelzebumon Advent Compilation"), an action figure of him, a prominent place on the official poster, two episodes with his name in the titles, and numerous magazine appearances. Yet, he was a minor character. After his "advent" episode, he was in a few episodes in a row then started Commuting on a Bus, showing up randomly (sometimes as a Deus Ex Machina) before getting killed off in episode 48. The Worf Effect: Shoutmon X4 gets beaten up a lot. In the last chunk of the first saga, this always meant it was time for X 4 B or X5 to shine. In the Death Generals saga, this meant OmegaShoutmon or his crossed forms had to take over. Xanatos Gambit: Wether the Death Generals won or lost didn't matter to Bargamon, he'd still harvest all the negative energy he needed, either from them succeeding or them dying. Xtreme Kool Letterz: "Cross" gets spelled with an X in the title and in most uses throughout the series; eg DigiXros, Xros Loader. Some translations and fansubs simply call internal instances, for example, "Digi X" and "X Loader". You Are Not Alone: Provided by Zenjiro and Akari when Taiki is lost and distraught over Shoutmon's demise at the hands of DarknessBagramon. You Can't Thwart Stage One: In spite of the hero's efforts, Bagramon goes ahead and initiates D5 anyway. Victor Gains Loser's Powers: Most of the Bagra commanders are able to do this. Year Inside, Hour Outside: Time flows faster in the digital world than it does in the human word, though not quite at the same ratio as in Digimon Adventure. Sorry Dorulumon, but Cutemon's parents are in another Zone! It gets resolved in episode 28. NeoVamdemon attempts to pull the same trick Vamdemon pulled in Digimon Adventure 02. Beelzebumon had other ideas. Your Size May Vary: Shoutmon X4 in particular. He goes back and forth from being about the same height as the average adult (age) Digimon like Knightmon, Beelzebumon, Tactimon, etc. to being large enough that Taiki can ride on his head. Sparrowmon. Sometimes he's only big enough to carry Nene. Other times, all of Xros Heart can ride him. ↑ From "Evolution & DigiXros Ver.Taiki"; it's much more Engrishy than the standard Digimon lyric fare, which normally make sense. Doesn't make it any less awesome, though, and it's pretty hard to tell it's English without looking up the lyrics.